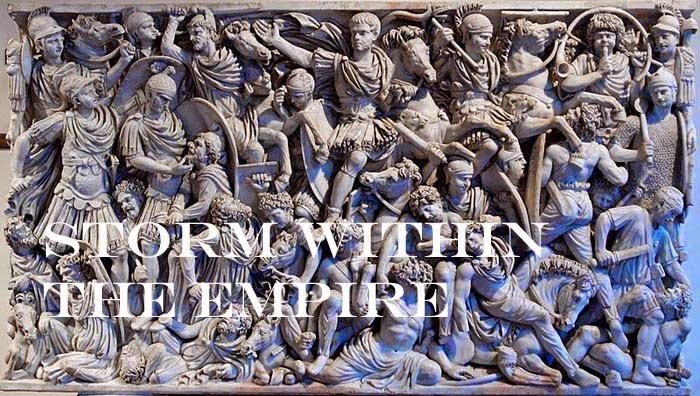 Storm within the Empire: Project Rome – Celtiberian and Lusitanian armies. Project Rome – Celtiberian and Lusitanian armies. The two Iberian armies are complete and ready for battle. Today I have begun painting the last two armies; the Celtiberian and Lusitanian. The Spanish are well covered in Duncan Head’s, the Armies of the Macedonian and Punic Wars and constantly reviewing the text I try to visualize colour themes that would help separate the four armies. The Celtiberian figures from Old Glory are right out of Duncan’s book, brass helmet, plume, sinew greaves and oval shield. All have cloak which should be painted black and from the depictions I have seen, the shields would have shield patterns not unlike the other armies. Tunics are described by Livy as “dazzling white” with purple borders which I just may use as the first two Iberian armies are multi-coloured. The Lusitanian figures will follow a similar colour selection as the Iberians; sober wool tunics of grey, brown, and olive so as not to compete with the brighter shield colour of reds, oranges and light brown. At this tempo I should finish these two by the end of the week. In the introduction of the second edition Macedonian and Punic Wars, the author acknowledges the increase of material brought to light by Fernando Quesada Sanz regarding the armament and fighting style of the Spanish; they were more than prepared to take the to field and fight Rome in a similar style, but lacked the discipline to sustain gains made in battle.